Lisa came into my shop one day while I was arranging Valentines day flowers and hired me on the the spot! 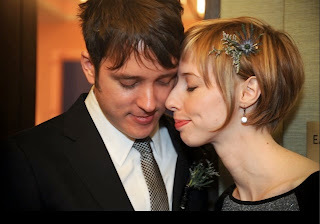 She was a fan of my jewelry and didn't know that I was doing flowers. 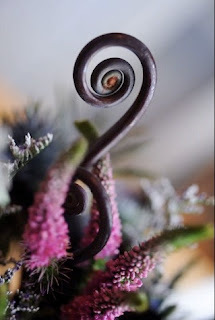 She gave me total creative control of her flowers after pointing out designs I did in the past that she liked. Next she sent me a photo of her dress, she said "this could only be considered bridal if I was on the star trek enterprise!" 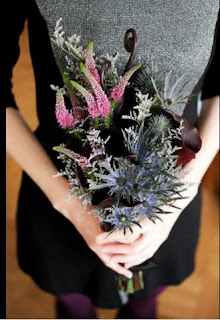 Her bouquet was made of black star callas, pink veronica, thistle, fiddle heads, and purple limonium. 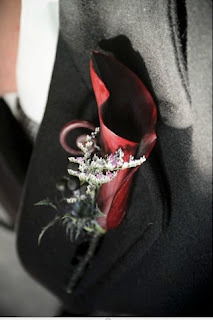 The groom wore a mini black star calla and black berries. 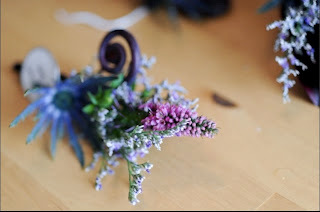 Lisa and her sister wore hair adornments with purple thistle attached to a clip.